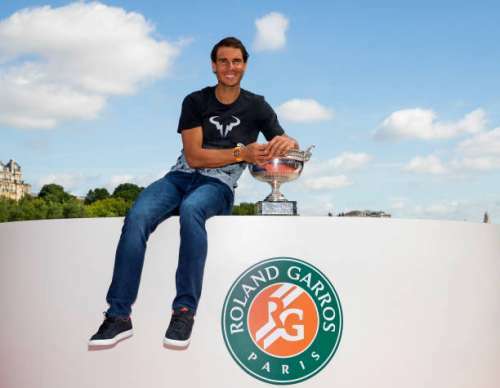 The Men’s Singles tournament of the 2017 French Open came to an exciting end with Rafael Nadal defeating Stan Wawrinka in the final, to win a record-bettering 10th French Open title and a 15th Grand Slam title, thus handing the Swiss his first defeat at a Grand Slam final. Nadal’s win also made him the first man and the second player, male or female, to win 10 titles at a Grand Slam, the other being Margaret Court with 11 Australian Open titles. The uniqueness of Rafa’s 15th Grand Slam title was the fact that he did not drop an entire set within the entire tournament with Robin Hasse winning the most number of games against him with 8 in the second round. However, there have been numerous instances when Nadal has won a title without dropping a single set and this article has been written to elucidate 5 such tournaments. Nadal did not have the best of finishes to his summer hardcourt season after being defeated by Nikolay Davydenko at the final of the Miami Masters. Nadal’s next tournament would be the Monte Carlo Masters where he was the three-time defending champion. Nadal did not have the easiest of opponents to face as he was up against former Wimbledon semi-finalist Mario Ancic in the second round. However, Rafa dropped only three games against the Croat and followed it with a win over former World No.1 and 13th seed Juan Carlos Ferrero in the third round in straight sets to qualify for the quarter-finals. Nadal then defeated 5th seed David Ferrer in straight sets to advance to the semi-finals where he avenged his Miami Masters final defeat to Nikolay Davydenko to reach the final where he was up against Roger Federer for the third consecutive time. Federer gave him a tough fight but Nadal edged him in straight sets to win his fourth consecutive Monte Carlo Masters title.